We were firstly drawn to Stevie R Pearce and his band when we saw an interview where he clearly showed a love of rock n roll. Most importantly, he also recognised the song writing brilliance of Donnie Vie (‘ex lead singer of the sadly under rated Enuff Z’Nuff). Against that background, opening numbers “Bad Day” and “Goin Down” came as a bit of a shock (but not in a bad way). These are full on, pedal to the metal, rockers that have a sound closer to early days Motley Crue than the pop rock of Enuff Z’ Nuff. It is quite clear that Mr Pearce knows his hard rock heritage. We’re talking a big sound with screaming guitar solos but also with strong choruses. We love the chugging guitar line of “Nobody Loves You” which has a Shotgun Messiah esque sound. The influence of Mr Vie does appear on a few tracks. “You” has a more laid back sound and there is hint of power pop to it, although it still has some ‘sonic’ guitar work (which indeed has a Derek Frigo sense of flash about it). The same is true of “Set My Soul On Fire” a pop/rocking number that in the early nineties would have been all over MTV. Although the big hit would probably have been delivered by the more sparse and melodic “Till Something Better Comes Along” or the ballad “Mamma’s Door”. Most of the songs though have a more ‘classic’ rock sound to them. It works particularly well on “Same Old Story” which neatly blends AC/DC style power with a dash of funk. Along with songs like “Can’t Turn You Back On Blood” and “Hooligan”, they’re the sort of songs that would have had people heading to the dance floor on a Friday night at Rock City (Nottingham UK). If the bands and names referenced in this review mean nothing to you then maybe this won’t immediately appeal to you. But then again if you like hard rocking music played with spirit and passion then you should still check this out. Hard rock music is in a tough place these days where only bands who seem to be a pastiche of former groups seem to find any kind of success. 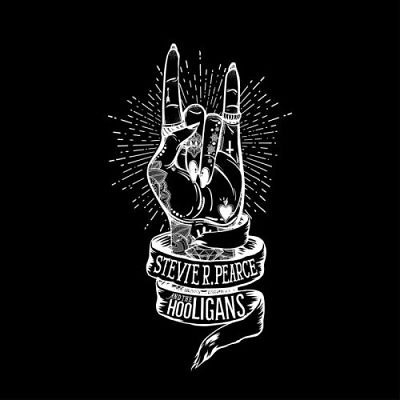 So, fair play to Stevie R Pearce who are sticking to their ‘big guns’ (another hint of their style for you sleaze rock aficionados!) and playing the music they love and a style that people still crave for.